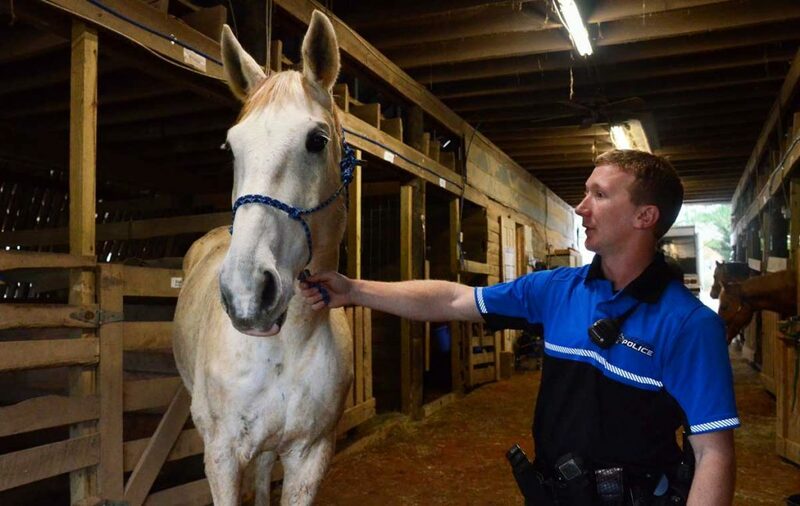 For those who frequently head to the Square on a busy weekend night, you’ve more than likely caught a glimpse of the Oxford Police Department horses watching over the busy streets. People may only notice the large, silky horses while coming and going from their favorite bars or restaurants. But not everyone knows where the horses are when they’re off duty. OPD currently “employs” seven horses that make up the Mounted Patrol Unit. When not patrolling the Square or training, the horses can be found enjoying normal herd behavior by spending free time in their pasture, playing, eating and snoozing. A civilian staff and a group of officers maintain the stables and ensure the horses stay healthy. Part of keeping the horses healthy includes feeding them an appropriate diet consisting of free-choice hay and a twice-daily portion of quality grain feed that varies depending on their breed and weight. The seven horses vary in age, with the oldest being Reggie, a quarter horse who is nearly 16 years old and has been on patrol since 2012. The youngest is Steep, a thoroughbred still in training, who is almost 4 years old. Anyone who has witnessed these horses on the Square can attest to their size. Horse height is often measured by “hands” – one hand is equal to 4 inches. They are also measured not by the height of their head but by the top of their withers (the ridge between the shoulder blades). While most of the mounted patrol horses are usually within about a hand of each other, ranging between 15 and 17 hands, the largest is Della, the lone clydesdale who is 17.2 hands (68.8 inches). Misenhelter said students often attempt to pet the horses. 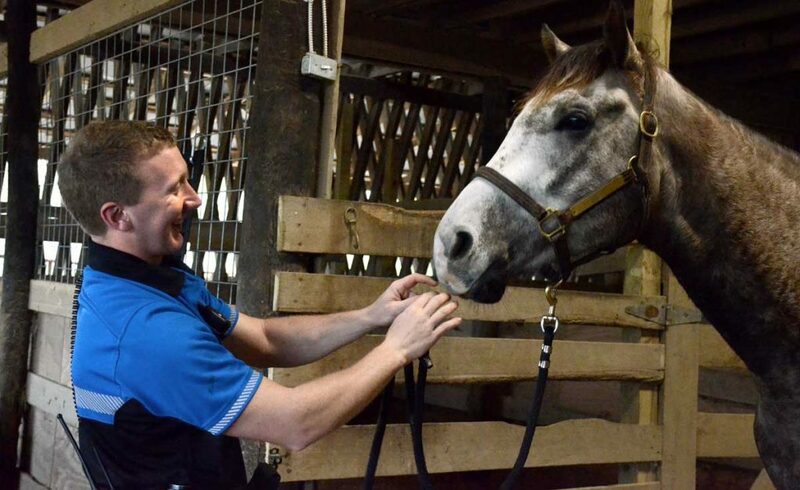 All of the horses are donated to the unit, often coming from local families and working barns, and usually with some saddle time already under their belts. The training each horse must undergo before making their debut on the Square ranges from a few weeks to a few months, depending on the horse. Claudia Billups is the barn attendant for the OPD horses. Her job entails feeding, taking care of the horses and preparing them to head downtown for their shifts. Because officers usually ride with the same horse for their shifts, horses usually only appear on the Square when their assigned officer is scheduled to work. Misenhelter said that having a mounted patrol unit here in Oxford is effective for crowd control. Horses can also provide benefits that could only come from having additional officers on the scene.